The coffee scene on the west coast is a pretty vibrant one and Milano explains their heritage on their website in proud terms, noting their long Vancouver legacy and family traditions. Their location in Gastown is a fairly spacey lot, with high ceilings, clean lines and a mix of industrial, artsy and comfortable concepts, textures and patterns in their lounge’s design. The base of their operations – their roasting facilities – is situated in the Mt. Pleasant neighborhood, not too far from the likes of Menya, the busy MEC flagship and the fun to browse Dunlevy Food Equipment store. Claiming to be dedicated to the old school Italian coffee tradition, Milano notes their key differentiator when it comes to their coffee product is their knowledge and dedication to a unique roasting and blending method – one that is not openly taught. And with their belief that what makes a great espresso is the blend quality. So much so that they even jack it up by using up to 11 beans in a blend, formulating options that run the full roast range (dark, medium, etc)! The Capital Hill area of the Emerald City is an intriguing one to go for a stroll around in. Bars, live music venues, theatre houses, fashion boutiques, bookstores and coffeehouses abound. I think you could spend a full day up and down the main streets of this area and get in a complete day of good eats and entertainment. One of the most popular places to unwind and get a solid cup of coffee is Stumptown‘s location on the steeply inclined East Pine Street. My only previous experience with their coffee was when I picked up some of their roasted beans in Vancouver’s Chinatown district. So I was keen on actually going to one of their two cafes in this part of Seattle. With limited seating outside and big glass windows leading inside, it was quite inviting from the sidewalk when you approach it. Stepping inside, you are in direct line of sight with the main service counter. Unlike food, I don’t get coffee. Not yet anyway. But someday soon, i hope to. You see, many years ago, back in my University days (where i met Shokutsu), I drank coffee for stimulation – typically to keep me awake through a combo of too little sleep, and boring boring classes. This was rocket fuel – sludge loaded with sugar and cream to make it palatable. It didnt taste good, but this was the way coffee was supposed to taste. Coffee was cool. An easy date. And a necessity. And i could learn to like it. Fast forward several years, and we have the proliferation of Starbucks. Expensive, catchy drinks with a lingo all its own. The drinks taste better than rocket fuel, but that’s because of the skinny, vanilla, extra hot, half and half, venti, whatever else is in the cup that makes it a coffee beverage. This tastes better than sludge, so im happy. But it doesnt taste like coffee. It tastes like sugar. And vanilla. But it’s good! 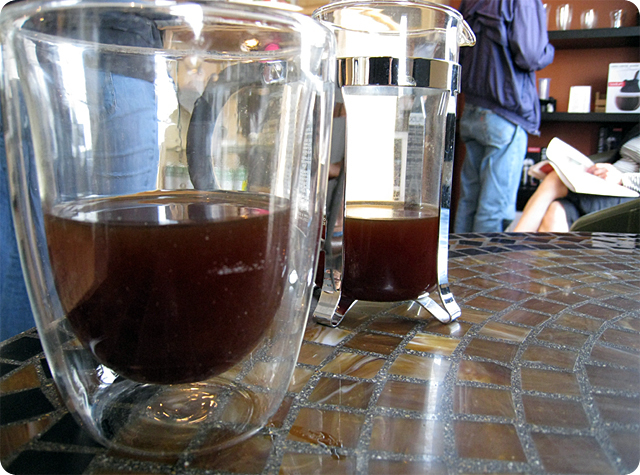 Today, there is a proliferation of “good” coffee – single origin, the concept of terroir, roasted dates, tasting notes. There is proper temperature and steeping time, fancy grinders and tampers. The complexity of coffee is endless. In the end, none of these things really matter. This coffee tastes better – that’s what matters. The bottom line is simple: Transcend Coffee produces great coffee. They are passionate about coffee. And they love to educate people about coffee. Running a small roasterie in an industrial area of SW Edmonton, they have added a small retail cafe to a thriving roasting business. Their prices are cheap – relative to the expertise and the quality of their product. They have experienced baristas, who compete at a high level, to produce your espresso drinks. These have the fancy art, and the really nice full flavour. The good crema on top of your espresso, and the great textured foam. They also have a Clover Machine – an automated french press that is able to reproduce a near perfect cup of coffee each time, bringing out wonderful flavours like chocolate, citrus, grass, honey out of the coffee. Coffee is surprisingly complex – more than wine, and similar to food. The flavours you can taste will surprise you. Drink it black. Bitter, rancid coffee doesnt happen here. It’s how you taste the good stuff. I feel particularly comfortable at Transcend. The room itself is warm and comfortable. The people are nice. The service is friendly. They have a small selection of food (in house baked goods, outsourced baked goods, sandwiches, and chocolate bars from Chocophilia). More importantly, they are happy to discuss their #1 passion – coffee. And they put up with all my questions, no matter how inane, or oft repeated they are. 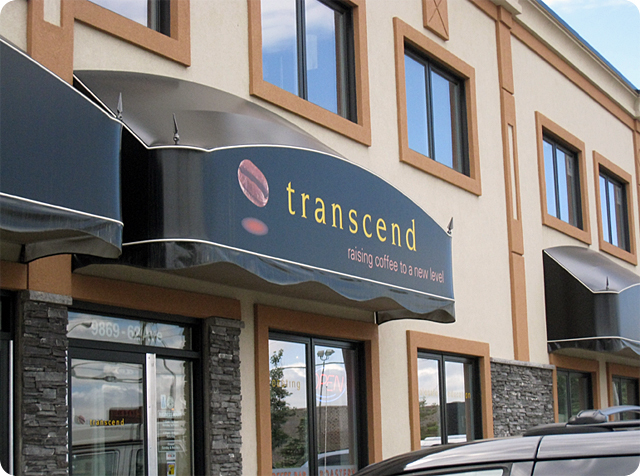 There is a slow growing movement towards “great” coffee – and Transcend definitely are helping lead the charge in Alberta. If you’re open-minded to trying it yourself, put down that cup of Starbucks and give it a shot. Like me, you may learn something new, and even enjoy it! Because afterall, at the end of the day, coffee, like food is about enjoyment. Consume what you enjoy. And if you get something more out of it, all the power to you. Maybe someday, i’ll get coffee. I’ll keep trying anyway. And in the meantime, i’ll keep going to Transcend Coffee, and learning a bit more about coffee sip by sip.